Less than 6' (1,80m) long when nested but almost 11' assembled, this dinghy is not only ideal to store on deck of a larger boat but in the back of a pickup truck or for the winter in a corner of the garage. The two parts are locked together by the removable center seat and secured by a set of simple bolts with wing nuts. She rows well but can also be fitted with the same sprit sail than the D4 and PK78. She can take up to 4 HP: the plans show transom reinforcements for outboard use. Material: Stitch & Glue . 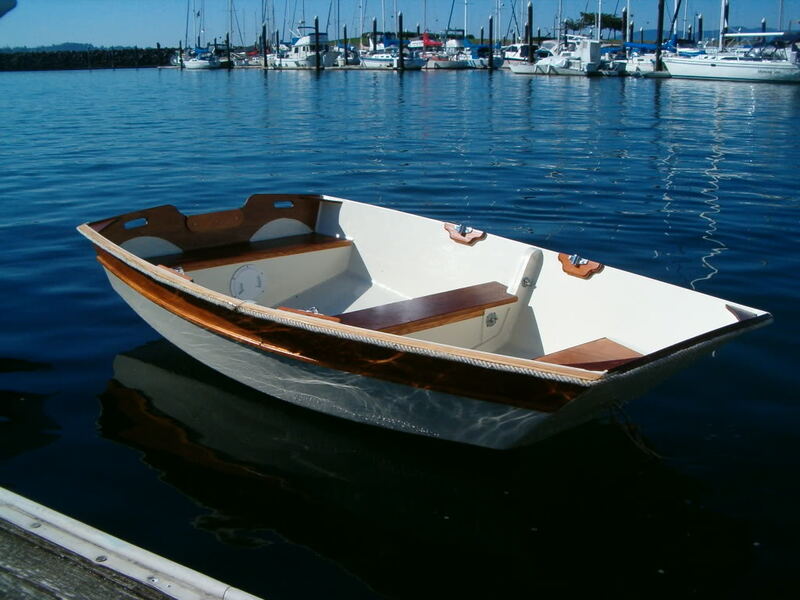 This boat is built from flat plywood panels assembled with epoxy-fiberglass tape. The construction method is called "stitch and glue". 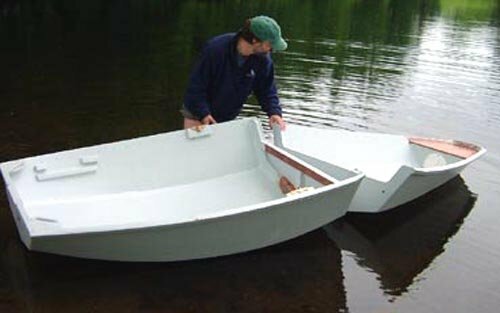 For a detailed description of the stitch and glue boat building method, see our "How To" section where you will find a complete illustrated tutorial as well as information about epoxy, fiberglass and plywood. The FB11 nesting dinghy is easy and fast to build but the nesting features requires more work than a one piece boat. The sides are cut from standard sheets of plywood. The sail option is show on the plans with drawings for all parts: rudder,dagger board. For the outboard option, we show a reinforced transom with doubler and gussets. Framing wood and hardware are listed on the plans. We offer an epoxy fiberglass kit with free shipping in the US. Our kit cost less than the same supplies bought locally. See the main page, top left panel. The average construction time for the hull is 70 hours. Detailed drawings , large scale with all dimensions required to cut the sides, bottom and the bulkheads from flat plywood sheets: no lofting, no templates required. Sailing version plans with all dimensions for rudder, daggerboard etc. Construction drawings with details of midseat assembly components, transom details, reinforced transom for outboard. No full size patterns at this time but if you absolutely want them, email. This boat is very easy to build without patterns. Read more information about our plans packages here.